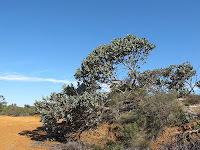 This eucalypt is a very common species between Esperance and Albany, extending inland to Peak Charles and the Hyden district. 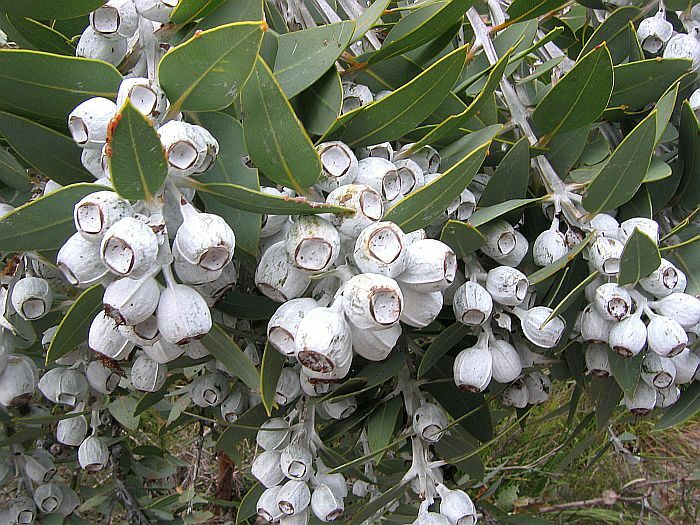 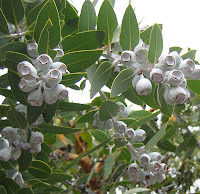 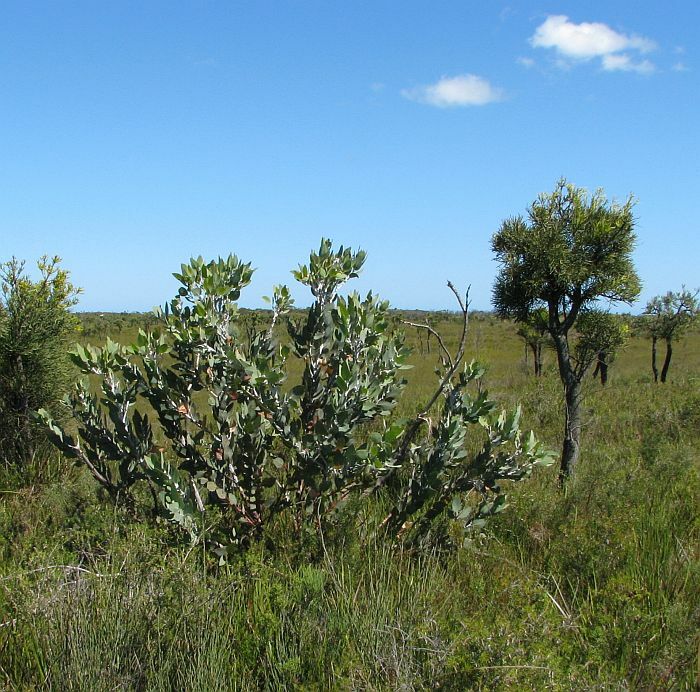 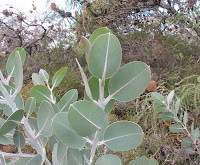 Around Esperance it is also found in sandy areas to the northeast of the township in the Mt Ridley region, but not in the far eastern or near coastal districts after Cape Le Grand, which is occupied by a similar looking mallee called Eucalyptus extrica (differences explained later). 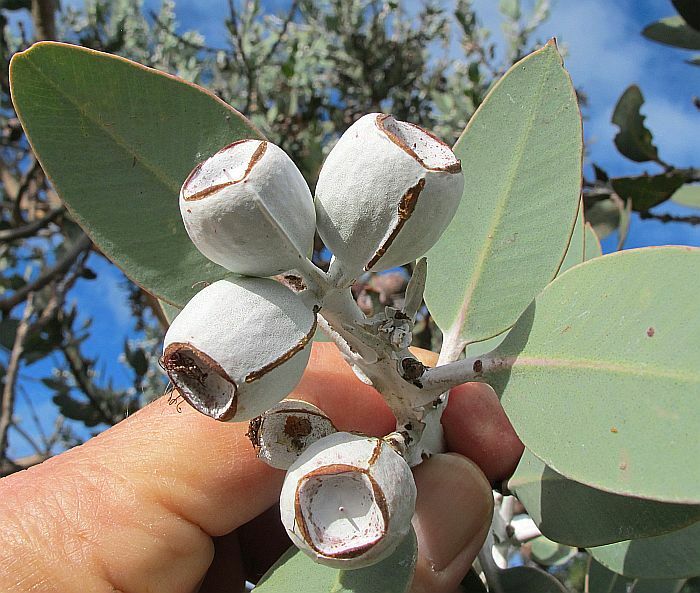 Eucalyptus pleurocarpa was known as Eucalyptus tetragona, but this is now only used to describe a hybrid between E. pleurocarpa and E. extrica, also found in the coastal regions east of Esperance (more details later). 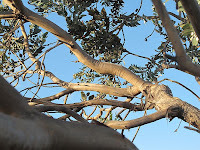 Eucalyptus pleurocarpa grows in non-calcareous sandy soil, sometimes over gravel or limestone and is a common feature of open heath and shrubby woodland. In coastal areas it seldom exceed 4 metres (13’) in height, but in mallee regions it commonly reaches 6-8 metres (20’- 26’) in height. 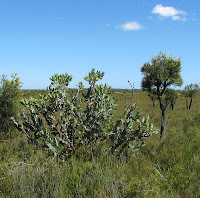 These tall mallees are generally represented by several bare trunks, growing from a large subsurface lignotuber with the foliage restricted to the upper parts, but are nevertheless still quite impressive. This species is readily identified by the glaucous foliage, stems, buds and fruits that glow pale blue and white even from a distance. 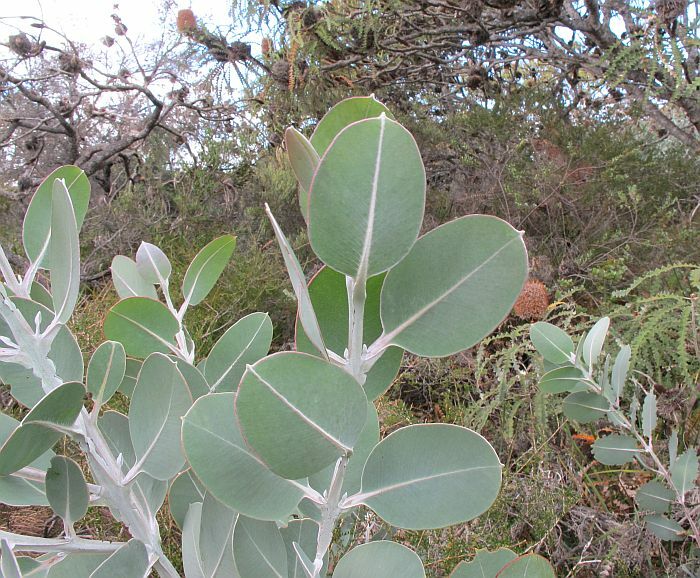 The similar looking species E. extrica to the east of Esperance, lacks this glaucousness and the leaves are green. 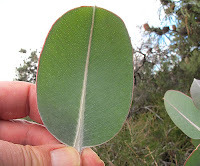 The hybrid between these two is known as Eucalyptus x tetragona and is similar to E. extrica, but instead of green foliage, has light glaucous foliage. Most eucalypts have a juvenile type foliage often quite unlike when adult, but some species like Eucalyptus pleurocarpa retain this juvenile foliage for life and with little modification, except with this species the leaves might vary from elliptical to broad ovate (more tapered top). The white flowers are arranged in threes and are often grouped towards the ends of branches, which coupled with the large white square fruits can produce interesting and attractive displays over several months, although November to February is when they usually bloom. 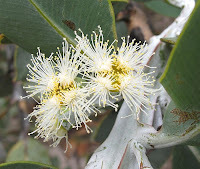 The flowers are mostly pollinated by insects, but are visited by a number of animals, as just about anything crawling over them would probably do the pollinating job. 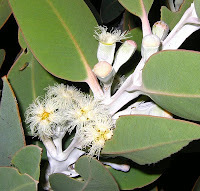 The only drawback in some areas with this eucalypt, is the attractive leaves can also be of interest to some leaf-cutting insects that can spoil the look of the plant, but the advantage being that with the next season’s growth, they will start afresh and can if required, be used in cut flower arrangements. 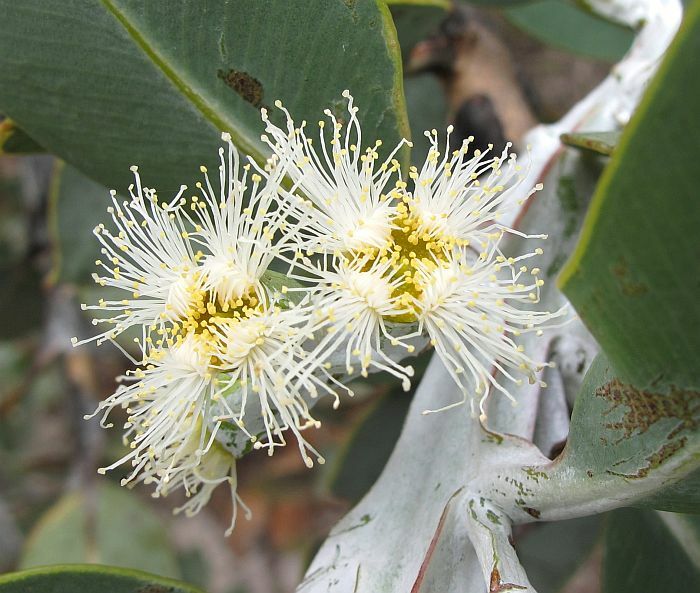 The Eucalyptus genus is part of the large Myrtaceae family.